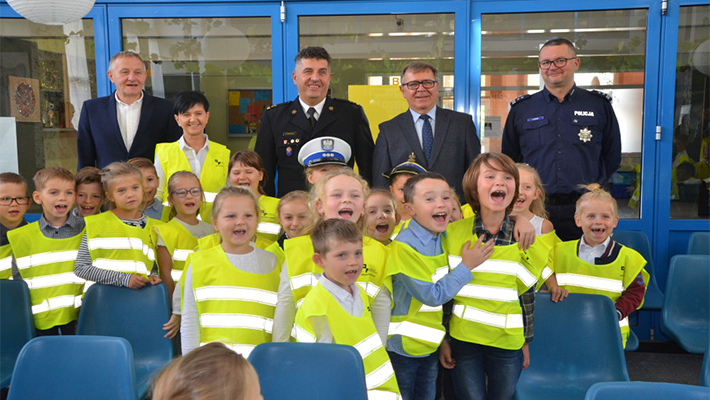 Nearly 5.5 thousand reflective vests will be given to first graders and their guardians from 17 communes this year’s seventeenth edition of the “Safe First Class” campaign. By the end of October, the vests will go to all first-class students. Over the past year, over 60,000 reflective elements were given to the youngest road users as well as to the adult inhabitants. “Children know that reflective vests with the reflective fabric significantly improve the safety of pedestrians, cyclists, and drivers. Often they tell their parents about it. We want children to be an example for the elderly, so when we are giving vests, we are also reminded about the rules of moving on the road, and we are talking about the operation of the carbon monoxide detector.” said Jan. “I call these students, for a reason, ambassadors of a safety matter, because thanks to them, we also reach their parents. The action is carried out by the Municipal Police Headquarters and the Municipal Police Headquarters of the State Fire Service. Every year, in 78 primary schools, meeting with first-graders are held, during which reflections are given to them, and children learn how to safely navigate the streets. Only in 2018, more than 60,000 zlotys were spent on the county budget for the purchase of vests for adults, children and other retro-reflective materials. The residents were among others reflective leg bands, brace for motorcyclists and runners, bags, overlays for spokes, bicycle helmets, backpacks, reflective elements for bicycles. Last year, the patient allocated 3.7 million zlotys to issues related to public safety, mainly for the modernization of the TSO’s refurbishment, refurbishment and construction of police stations. During the annual “Safe in the patient” picnic, firefighters from 36 OSP units receive special equipment, like saw blades, slurry pumps, nozzles, and hoses. “We have allocated 13 million zlotys for security over the past years!” said Jan. And he reminds you that another edition of the “Carbon Monoxide Detector May Save Your Life” project is underway. So far, 650 carbonate detectors have been handed over to the winners.